Creativity is often considered an innate gift, not something that can be learned or optimized. In fact, there is an entire branch of science devoted to dissecting, understanding, and stimulating creativity. Scientific American, the oldest continuously published magazine in the U.S., has been bringing its readers unique insights about developments in science and technology for more than 150 years. 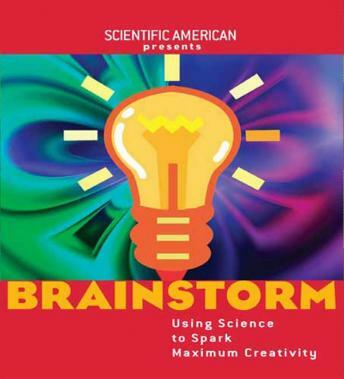 BRAINSTORM brings together material previously published in Scientific American Mind: Fostering Group Creativity, Unleashing Creativity, Principled Problem Solving, and The Eureka Moment. It provides a fascinating, informative, and clearly explained exploration of the science of creativity, breaking down right versus left-brained thinking, the relationship between intelligence and creativity, and why sometimes it's important to think inside the box. Learn how to ignite your creative spark through restructuring problems, keeping a curious and open mind, and knowing when to rest and let your unconscious mind do some of the work. The audiobook also features a roundtable discussion on creativity with several leading scientists and Scientific American editor Mariette DiChristina.